Our guest writer this month is Hannelore Jenner. Southern California was Hannelore’s home before she and her husband transplanted to South Carolina. I met Hannelore and her husband after their move, while we were all involved with native wildlife care and rehabilitation. Hannelore’s devotion to butterflies and their care is phenomenal. More so is the miracle of metamorphosis she describes that occurs in gardens everywhere. GardenSmart is pleased to offer this information on butterflies from Hannelore Jenner. 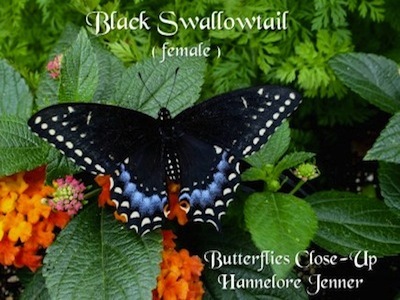 The black swallowtail butterfly is mostly black with patches of yellow. The female shows a series of yellow spots on the wing. The Male exhibits a narrow band. 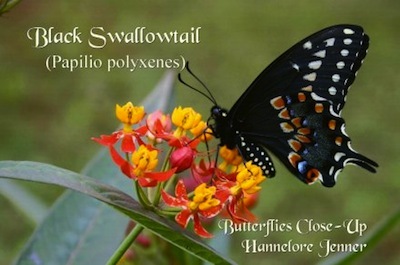 The Black Swallowtail is a common visitor to flower and vegetable gardens throughout most of the Eastern and Southwestern U.S.
PRIMARY HOST PLANTS (Larval Food): Parsley, Dill, Sweet Fennel, Carrot Tops, and Queen Anne's lace. FAVORITE NECTAR PLANTS: Buddleia, Lantana camara, Phlox, Zinnia, Asclepias, and Salvia cultivars. Females scout for nectar plants to feed on and host plants on which to deposit their eggs. At this time, they are vulnerable and could fall prey to spiders, robber flies, and birds. Man also takes a toll on butterflies with pesticides, herbicides, and fungicides. To create a safe environment one must refrain from the use of any chemical. Only about 2% of all eggs laid will survive predators and become adult butterflies. THE EGG Consider the egg step number one in the life cycle of a butterfly. 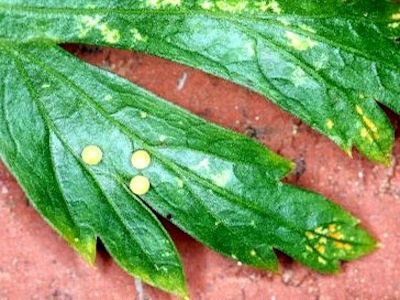 To locate an egg of this small size requires very close and careful examination of a host plant. Gentleness while inspecting leaves is very important to avoid destroying fragile eggs. The female butterfly uses all of her senses to locate an acceptable host plant and deposit her eggs. They are glued onto the leaf, or any other plant material, with a sticky substance that will harden into a shell. The egg of this butterfly is round, pale yellow and usually laid singly. In about 5 days, depending on temperature and humidity, the egg becomes almost black and translucent. Now the very minuscule caterpillar cuts through the eggshell and consumes the shell for its first meal. Many beneficial insects feed on butterfly eggs such as lacewing, ladybird beetle, and wasp. This helps explain why about one egg in 50 will make it through a cycle. 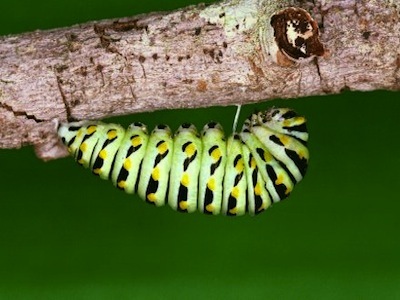 THE CATERPILLAR (larva) In a very early stage, the larva is black-brown with a white saddle. It is bad tasting to predators, such as birds, due to the absorption of toxins from the plants it eats. Food for these caterpillars belongs to the carrot family: Queen Anne’s lace, Parsley, Dill, Carrot Tops, and Sweet Fennel. All of these are referred to as larval food plants and/or host plants. 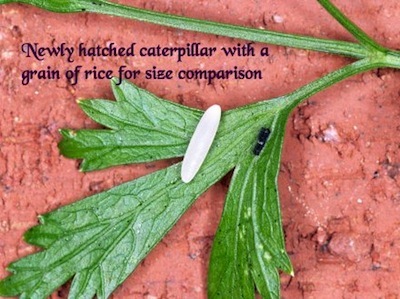 Newly hatched, the tiny caterpillar will eat by scraping the leaf of the host plant. In this early stage, it seldom creates holes in the leaves. It also looks very similar to bird droppings, further disguising its presence from predators. After about five days, the caterpillar will consume larger amounts of food and grow rapidly. Now there will be large pieces missing from the leaf on which it is feeding and its droppings will be evident even to the casual observer. Unfortunately, humans destroy many caterpillars found on cultivated food plants and crops. MATURE CATERPILLAR (prepupal larva) A caterpillar is the larval stage of a butterfly or moth. One defense mechanism on this caterpillar is a protrudable forked scent gland (osmeterium) that is capable of emitting a foul odor. As the caterpillar continues to grow it becomes too large for its skin. It will cease eating for about 24 hours and shed the skin. This process is called molting. At each molt, it will change colors and take on a bright new appearance. Stages between molts are called instars. The caterpillar will repeat this process several times. After each molt, the caterpillar will resume eating. During the last instar, the caterpillar is hardly recognizable compared to its earlier stages. It will stop eating and rest for about 24 hours before searching for a place to attach itself to pupate. THE CHRYSALIS (pupa) The black swallowtail chrysalis can be two-tone in color with yellow and green, light tan or dark brown influenced by the last color the caterpillar saw. A chrysalis that will overwinter is usually brown for camouflage purposes. Of the eggs laid in late summer or early fall, about 50% will overwinter as pupae. These will emerge the following spring to start the new colony. After the caterpillar finds a suitable branch or twig on which to hang, it will spin a pad of silk with its mouthparts and attach itself by means of hooks at the end of its abdomen. Then it will wrap a girdle around the upper body and attach it to the branch. All swallowtail butterflies prepare to pupate this way. The chrysalis will form under the skin of the caterpillar, and then the skin will shed, revealing the chrysalis. Just before the butterfly emerges, the chrysalis turns dark, transparent and some of the wing markings are visible. THE EMERGING The freshly emerged butterfly is drying its wings in preparation for flight. Wings are completely covered with scales, and in most cases, the colors and designs will be different on the upper and lower surface. These scales can rub off and should never be touched. In approximately nine to fifteen days, metamorphosis is complete and a beautiful black swallowtail emerges. 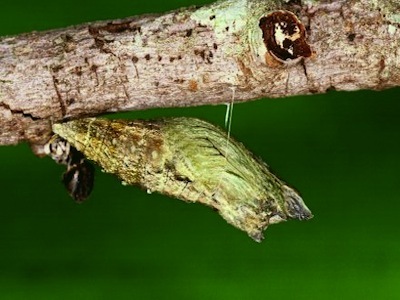 The pupal (chrysalis) skin splits open near the head and the adult butterfly crawls out with its wings furled. The butterfly will move to a place where it has room to hang by its legs. The adult swallows air, which helps to pump fluid into the veins of the wings, causing them to expand. The first 15 minutes of a butterfly’s life are critical since it can never fly on wings that do not unfurl completely. The butterfly will remain motionless until the wings harden, and then take flight to start the process all over again.